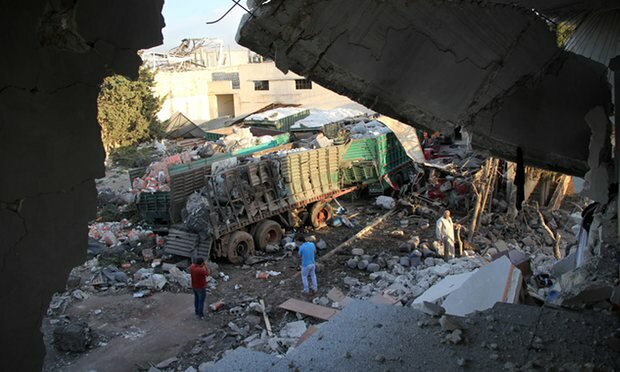 The UN Humanitarian aid agency has suspended its activities in Syria after a humanitarian and relief aid convoy was struck by warplanes on Monday night in the Urum al-Kubra area near rebel-held Aleppo. Dozens of people, most of them aid workers, are reported to have been killed and the Syrian Arab Red Crescent (SARC) said a warehouse and 18 of the 31 aid trucks in the convoy were struck. The attack came a few hours after Damascus declared an end to the US-Russia negotiated ceasefire. UN Special envoy for Syria Staffan de Mistura condemned the attack lamenting that “the convoy was the outcome of a long process of permission and preparations to assists isolated civilians.” “Our outrage at this attack is enormous,” Staffan de Mistura said. No group has claimed responsibility but fingers are being pointed at the Syrian army. Stephen O’Brien, the head of the UN relief organization, warned that “if this callous attack” proves to be “a deliberate targeting of humanitarians”, it would be termed “a war crime.” He said he was “disgusted” by the attack because the convoy has been clearly marked and their route provided to warring parties. Meanwhile, the US and Russia that brokered the ceasefire are still questioning each other’s commitment to the agreement and they have not announced its end amid the renewal of hostilities. Moscow is a strong ally to President Assad while Washington backs the rebels. Their efforts to cooperate have been stalled by the lack of compromises on their stance. Written by: Peter Mulvany on September 20, 2016. Posted by Peter Mulvany on Sep 20 2016. Filed under Gulf News, Headlines. You can follow any responses to this entry through the RSS 2.0. Both comments and pings are currently closed.